What causes a person to dig deep and devote their life to someone they hardly know? When a child is abandoned by a family and neglected by society, what moves another person to say, “I’ll take the responsibility?” Maybe it’s faith. Maybe it’s a heightened social maturity. Or maybe there’s a sense that both people will be blessed in a powerful way. In the case of Becky and Jimmy, I think it’s all three. Becky was twenty-five years old and a high school drop-out. She was a single mom living with her daughter in a rented a single-wide trailer. She did odd jobs and made only $3,000 a year. I’m guessing a lot of people would look at her, shake their heads, and make assumptions about her work ethic, the kind of mom she must be, and where her life was headed. They’d be very wrong. Becky is determined. Selfless. It turns out she’s a role model as a parent. And as a person. She had previously spent five years in the Navy as an electrician. Now Becky was studying to be a nurse, and volunteering as a youth leader at church. She first saw Jimmy at a church group meeting that met in her mother’s home. He was a classmate of her sister’s and he came because he heard there was free food. Jimmy showed up at meetings wearing dirty shorts and a dirty tank top. With holes in his shoes. And it was winter. He asked a lot of questions, and he’d argue about anything… but he kept coming back. One night, as they asked for prayer requests, Jimmy spoke up and he sounded panicked. He asked the group to pray that his mother wouldn’t put him back in a group home. I’m sure many people would have seen that scared young man, heard his plea for prayer, and it would have touched them. They’d pray fervently… and then they’d go home, hoping that God would take care of that poor kid. But Becky felt she couldn’t just pray about it and let it drop. She felt compelled to do something. Right away. So she invited Jimmy to come live with her and her six-year old daughter. Over time, his story began to unfold. He had been living with his mother in an apartment, sleeping on an Army cot, and he kept all his belongings in a shoebox. During Jimmy’s young life, his mother often had left him with other family members, including his former stepfather. When his mother refused to pay the man the $98 a month she received from Jimmy’s biological father, the stepfather signed Jimmy over to social services. After she took Jimmy back, his mother soon gave him up again when her boyfriend – who would often beat Jimmy – told her to get rid of her son. So Jimmy’s mother drove him to an orphanage, signed the required papers, and left him there. The older boys in the home beat Jimmy so badly his eyes were swollen shut and he was forced to stay in bed for four days. When he called his mother and begged her to take him out of the home, she hung up on him. But quitting was never an option for Becky. She involved Jimmy in family decisions – like the time they only had enough money to pay either the electric bill or the water bill, but not both, so she put it to a family vote. She told Jimmy he had to quit football and get his grades up, or she’d send him back to his mother. Becky told him that doing poorly in school was unacceptable, that he was better than that. 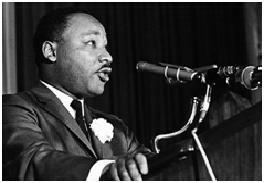 No one had ever believed in him, let alone challenged him to excel. Jimmy responded. He began to get A’s in his classes. 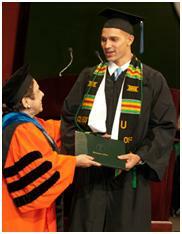 As Jimmy started to do well in the classroom, he also began to blossom as a basketball player. He was recognized as one of the top one hundred high school players in the country and he accepted a scholarship to the University of Miami. 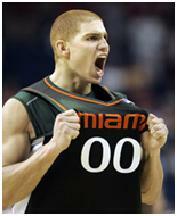 He was a tough player during his four years on the Canes basketball team, and became a crowd favorite. Fans appreciated his hustle, his toughness, and his great attitude. He had the opportunity to play professional basketball in Europe, but chose instead to use a final year of eligibility to play football. 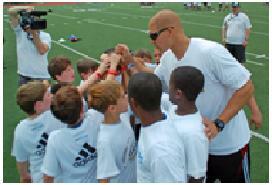 The young man was Jimmy Graham, now an All-Pro tight end with the New Orleans Saints. He only played one year of college football and just finished his second season in the NFL. 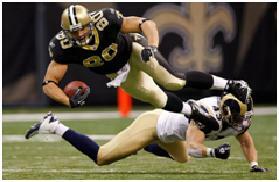 During the 2011 season, he had the second most receiving yards by a tight end in the history of the NFL. He has an amazing work ethic and an attitude about life that lets you know this young man can conquer anything. Given his past, you could understand if he walked around with a boulder-sized chip on his shoulder. But you learn about his character from his actions and the things people say about him. Being a mother to the two best kids in the world should be celebrated everyday! I am blessed beyond words! Happy Mother’s Day! I am speechless when I look at the example that Becky set. Single mom. High school drop-out. Living in poverty. Yet she raised Jimmy into the kind of young man we want our children to become. She can teach us all something about being open to God’s call. And investing in a child when no one else will. Becky and Jimmy. Not only have they blessed one another, but they’ve blessed us as well. You certainly have a knack for sharing the stories that really matter. They remind us how we can make a positive difference in the lives of others by taking time to reach out to someone in need. Becky Vinson embodies that spirit of giving and caring,truly making a difference in Jimmy’s life. What a heartwarming and inspirational story of love and hope. Thank you for sharing such a poignant story. It certainly holds a message for all of us. Thanks, Kathy. I continue to believe that the most inspirational stories come from the least likely sources. No one expected Becky Vinson to do what she did, which makes the act – and the outcome – all the more amazing. I am reminded of Matthew 25:40 “The King will reply, ‘Truly I tell you, whatever you did for one of the least of these brothers and sisters of mine, you did for me.” You’re right, Kathy, it is a story of love and hope. And a great model for us all.